As a Ground Control Station (GCS), WKM View enables DJI autopilot system WKM the ability to monitor real-time flight state. It is an advanced feature of WKM. WKM View will display 3D map, monitor attitude, coordinate, speed and angle of aircraft, monitor signal quality of wireless data link module and power voltage for you. 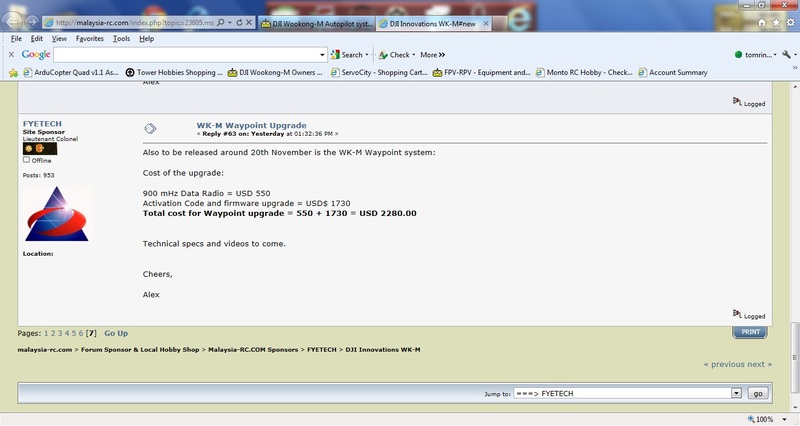 It is specially designed for high-end WKM users. Click Go Mode is an upgrade package of WKM View, which gives you an extra tool for flight operation. This tool allows pilot to drag single flight route on 3D map, assign altitude and flight speed to a single destination. Altitude, speed and destination point can be changed on-the-fly with flight path tracking. Click Go Mode strengthen the WKM View, which brings you more exciting flight experience. Very nice system but what is the pricetag for all the upgrades? I read that the auto navigation option will be more than the initialwookong price. Looking at where ACM is now, I'm certain it will be at least as good. I believe the controller is barometer only. Who say CN people can't make high tech "toy"..
Really cool. What catches my attention was the impressive position and altitude hold. Thumbs UP! Yes they seem to have taken the Mikropkopter guys by storm. While its not cheap, the performance seems good and its far more plug and play than the existing high-end gear. I'm writing my letter to Santa today! If only the Goog map had decent imagery. They have high resolution images of abandoned houses in Arizona but only blurry images of where the magic happens in Hong Kong.